It’s hard enough to keep face-to-face meetings on schedule. But conference calls can become a noisy free-for-all. Here’s how to run them smoothly. 1. Limit the size to foster group interaction. The ideal number is seven to nine participants. 2. Start with a round of introductions to create a spirit of inclusion. Ask participants to specify their role and what they expect to get out of the meeting. 3. Engage everyone. Keep prompting callers by name to speak up so that they’re less apt to zone out. In a 2012 survey, three-fourths of respondents said one of the biggest drawbacks of virtual meetings is that participants struggle to build rapport. It’s hard to feel like you’re part of the team when you call in while others in the same room are laughing at jokes that you cannot hear. 4. Draft a detailed agenda and stick to it. Beware of allowing side conversations to interfere with the main items under discussion. 5. Talk less than you would if the entire group were sitting around the same table. When you can’t see everyone, it’s more important to ensure everyone’s voice is heard. 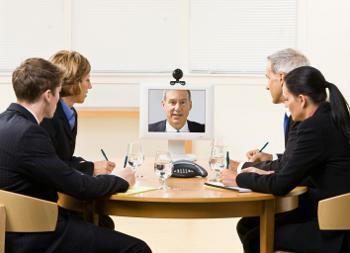 A danger in conference calls is that a silent participant might get annoyed and withdraw. To prevent stewing anger, prompt quiet employees to open up. — Adapted from “Help! I’m on a Conference Call,’” Sue Shellenbarger, www.wsj.com.